AUCKLAND, 10 AUGUST 2015 – New Zealand remains a key Oceania market for Tourism Malaysia as the country seeks to grow the number of international visitors to 36 million and tourism receipts to more than MYR 168 billion (NZ$66.1 billion) by 2020. Dato’ Azizan Noordin, the Deputy Director General of Tourism Malaysia, says a delegation of travel trade representatives who are accompanying him to New Zealand are keen to share what Malaysia offers to New Zealanders. 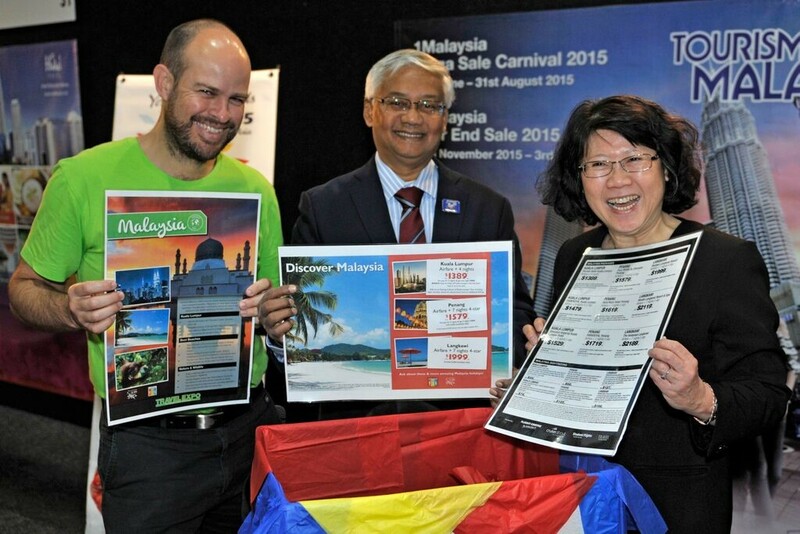 He attended the Travel Expo organised by Flight Centre, a travel wholesaler in Auckland (8-9 August) and also met with agents and media at the Tourism Malaysia Roadshow at the Crowne Plaza in Auckland on 10 August 2015. The Malaysian Delegation consist of representatives from the state of Sabah, Terengganu, Kuala Lumpur City Council, Malaysia Healthcare Travel, Hotels and Resorts in Malaysia. In a recent Tourism Malaysia survey New Zealanders were found to be among the country’s top spending tourists per capita. Zalina Ahmad, The Director of Tourism Malaysia in New Zealand says her team has responded by working with Flight Centre to create new shopping packages, some of which coincide with Malaysia’s famous Year End Sale during November and December this year. The packages were launched at the Travel Expo by Dato’ Azizan and Dato’ Lim Kim Eng, Malaysian High Commissioner designate to New Zealand. “With sharply priced airfares and accommodation packages combined with the fact that Kiwis get 2.5 times their money when they exchange NZ dollars for Malaysia ringgit, we think these packages will be really attractive for those who like to add a little shopping into the mix when they go on holiday,” says Zalina. To further emphasise shopping in the region, Zalina has invited Baizuri Baharum, the head of the Shopping Malaysia Secretariat to present Year End Sale packages to agents at the Tourism Malaysia Roadshow. Other offers for the New Zealand market specifically encourage spending in Kuala Lumpur, including the KL Pass discount card and Showcase KL transit tours for travellers passing through KL onto other destinations. Dato’ Azizan says tourism is the second largest foreign exchange earner for Malaysia after manufactured goods and is one of the fastest growing economic sectors contributing directly 5.7% of GDP. The delegation will continue to organise travel mart and meeting with agents in Sydney, Perth and Brisbane, Australia from 11 to 14 August 2015.